Minus the blood, there was a lot of sweat and probably a few tears at the Junior Rochester Knighthawks’ tryouts earlier this month. Fourteen Onkwehón:we lacrosse players were selected to play for the Peewee, Bantam and Midget – level teams, out of a group of about 90 hopeful players trying out. Kanesatake’s Owen Rice will be placed on the Junior Knighthawks’ starting Peewee roster in upcoming tournaments. 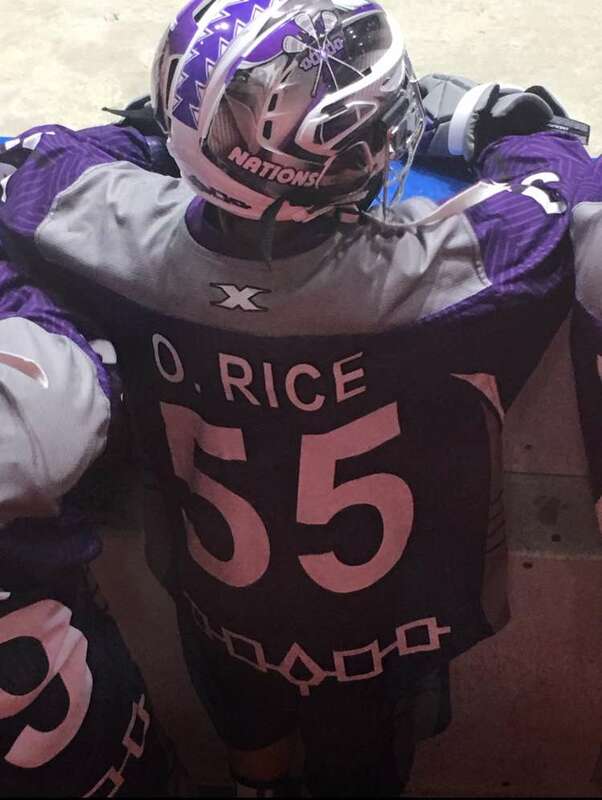 Owen was not at the tryouts August 2-6, but was scouted by the National Lacrosse League (NLL) team, explained Owen’s father, Dave Rice, originally from Kahnawake. “It was his first year playing for Team First Nations and somebody from the organization had selected two players from their team to represent Rochester Knighthawks’ Junior team,” said Dave. “Owen had a great box background playing with the First Nations team – that’s why he wasn’t able to make tryouts. We knew he had a great experience and he’s a really hard-working kid with some great skills and so he’d be perfect for our team,” said Gillies. At Midget-age level, Koleton Marquis, along with Tekaronhiawakon Cross, Tehonatake Nicholas and Watharonhia’khahsi Diabo from Kahnawake, were also selected to play with the Jr. K-Hawks. “I’m mostly looking forward to the tournament,” said Marquis, who has been playing with Kahnawake Mohawks since he was four years old. Diabo had a chance to play for the Jr. Knighthawks in past winter tournaments and he felt confident going into tryouts this time around. He first heard about the tryouts through some friends from New York who told him to come and play. “I’m looking forward to playing with my friends for the last time in a Knighthawks’ jersey and representing Kahnawake at the highest level,” he said. Gillies said that practice has already begun, with the coaches focusing on refining box lacrosse skills like the pick and roll drills. There was also a tournament this past weekend. See how well the Junior Knighthawks team does when they play at the sixth annual Jr. NLL Tournament from August 24 to 26.